Explanation: In this picture, the Sun's surface is quite dark. A frame from a movie recorded on November 9th by the orbiting TRACE telescope, it shows coronal loops lofted over a solar active region. 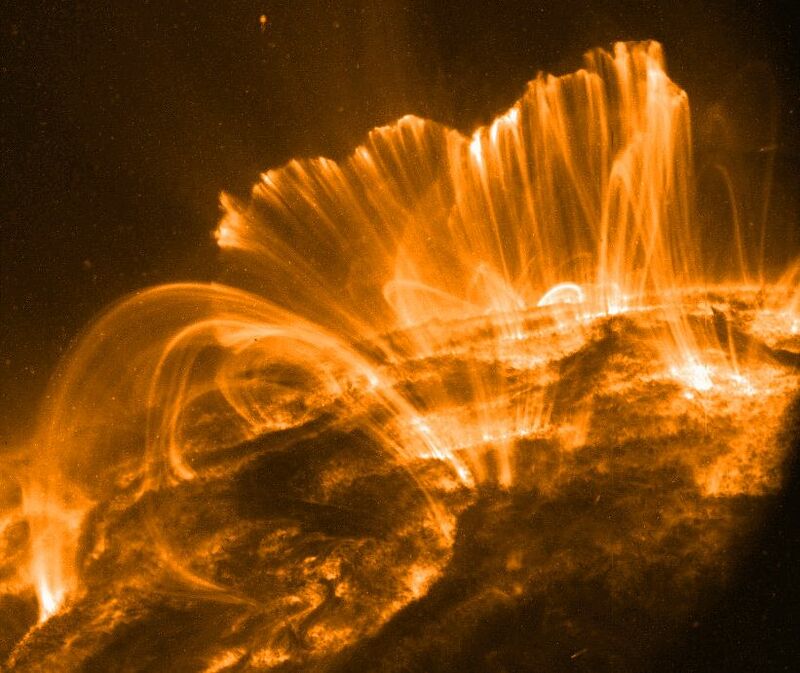 Glowing brightly in extreme ultraviolet light, the hot plasma entrained above the Sun along arching magnetic fields is cooling and raining back down on the solar surface. Hours earlier, on November 8th, astronomers had watched this particular active region produce a not so spectacular solar flare. Still, the M-class flare spewed forth an intense storm of particles, suddenly showering satellites near the Earth with high energy protons. The flare event was also associated with a large coronal mass ejection, a massive cloud of material which impacted our fair planet's magnetic field about 31 hours later. The result ... a strong geomagnetic storm.